Now on the 19th of August, I get this woman from the County Administrative Board paying a visit to me in my apartment, saying she’s from the pet supervision section of this public authority and that they’ve learned that the cats might be neglected (!) in my house. She asks if she can come into my apartment and inspect. I let her do that, being hospitable and all, and show her both the litter box and the bowls the cats usually eat from. 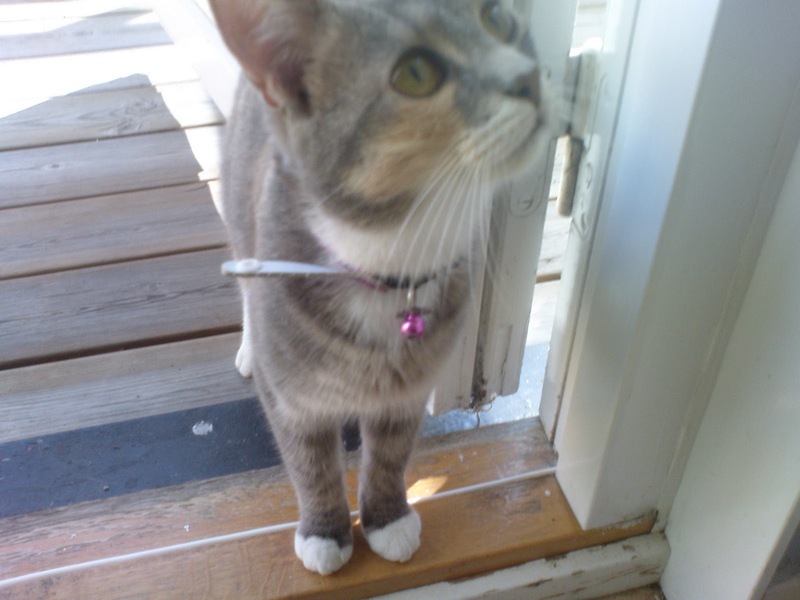 She also wants to see the cats, so I show them to her – when she enters, only the female is inside, so I step out on the balcony and look for the male too, and thankfully he shows up as well, so I can let the woman inspect the two cats that I keep in my home. She asks about their age and whether the male is castrated. I’ve not checked myself – to be honest, I’ve never taken too great an interest in cat genitalia and don’t know how castrated cats look. So I lift him up and show that part of his body to her to inspect, and she tells me he doesn’t appear castrated. She’s pleased to see that they appear to be just fine, but still asks me about how I keep them. I tell her I usually give them dry food since that’s cheaper and that I give them milk since they don’t seem very interested in drinking water. Once a day I give them a bit of wet food, but sometimes I find that the bowl out on the balcony attracts flies when they’ve not finished eating it – the dry food doesn’t on the other hand. She now tells me that the cats are still required to have access to water, but that it’s possible that they might still find that if they can walk outside. The woman also tells me that if I keep cats, I’m required to check on them at least twice a day, and I console her by telling her I do that. This is not quite over yet though; she’s also concerned about how it will be during the winter if I keep two cats in my 1-room apartment and I can’t keep the door open to let them run out as they please. Then I tell her that I’m only keeping the cats temporarily for my half-sister and that I’ll return them to her long before the snow is here. Now she wants the name and phone number of my half-sister, so I tell her that, and she also hands me her contact information, telling me I’m supposed to inform the County Administrative Board when I return the cats to my half-sister. Naturally I’ll be such a vigilant servant of the state as to do that… Finally, she asks for my phone number as well and I hand her that too. Bureaucrats sure can make it a hassle keeping pets… I wonder if I made the right move in telling her that the reason my half-sister couldn’t take care of the cats was because she’s incarcerated. Life in Sweden… Is there any wonder I daydream about another life? I guess if you lack company, it’s not very hard to get government employees to come visit you though. Two cats too lazy to be catching rats. Why chase rats when you can sleep in your master’s bed all day until you get up and meow a bit to be fed? I think there must be some essential difference between country cats and city cats. When I grew up in our cottage out in the country, we had several generations of cats, and though we generally provided them with food when they were kittens, as they grew up they went outside and caught rats on their own, securing their food supply that way. They usually came back to our house for the company, or we’d call on them to give them special treats such as perhaps some herring. Our first cat, called Missan, who became the ancestor of all subsequent cats, once even caught a white hare that she brought back to the house in her mouth. If any cat that wasn’t her offspring snuck into the house, she’d make them sorry. I even remember once when a male did just that, and she went after him with such a fury, chasing him across floors and window seats until he got the message that he had to get out. The two cats I have now have not caught a single rat during the four weeks or so I’ve had them, they rely on me exclusively for food even though I let them go outside. And naturally the food I give them isn’t good enough for them, they keep meowing and I have to figure out just what they want now. 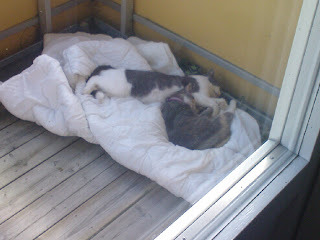 Every morning I wake up, they’re sleeping on the quilt out on the balcony, waking up and rushing inside as I open the door. Now and then other male cats in the neighbourhood walk up to the balcony when they see my female cat. When my male cat spots one of them approaching, he runs for safety instead of chasing them away. The cats sleep for 20 hours a day and spend at least an hour each of the remaining time washing themselves or eating the food I serve them. Well, what do you know. This morning the female actually ran into my apartment with a bird in her mouth, as if she’s sensed my dissatisfaction in the two. It managed to get loose from her jaws and fly around a little inside before the male cornered it and took it instead, without the female noticing. Now she’s meowing and searching for it in my apartment, poor girl. Maybe I should give the male less food so he’ll learn to catch his own prey… But then I guess I’ll get Länsstyrelsen on me again. The cats have come right in from outside and already one week after have managed to soil the paper to this state where it was lying. Sometimes I think they can read, and that they’re simply showing the authorities the proper respect. Maybe the government should put the cats up on Facebook so everyone in detail can follow the events of their lives. What kind of government business is it just when I return the cats? Thanks for the suspicion… Just because you see that the cats are all-right doesn’t mean that you can’t bee too sure. I guess I was lucky not to be charged for the unannounced inspection. 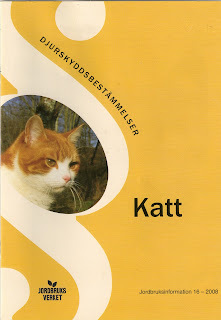 I was also given a printed 14-page colour brochure from the Board of Agriculture (Jordbruksverket). Oh, and I didn’t know how to do that until the government told me. Man has kept cats for thousands of years with their enthusiasm intact. Now in 2008, the Swedish government decides this must be regulated under law. Ok, the bold emphasis of the words “you will” in the following quotes isn’t present in the brochure, but is simply me highlighting the outrageous language. You or someone else will look after your animals at least twice a day. Young, sick or injured animals shall be looked after more often. 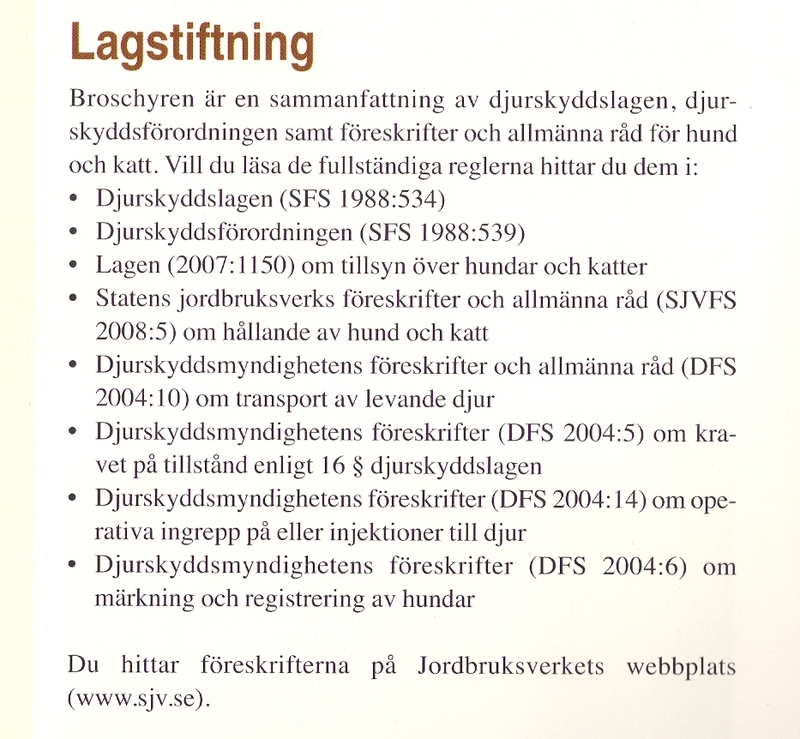 “The Swedish regulation on breeding makes clear what is acceptable as far as animal protection goes when it comes to breeding cats. It also supports the means of controlling genetic deficiencies that today take place within many race [breeding] clubs. Eugenics for cats… Maybe this is why the country cats I grew up with seem gone these days – some government planner decided that cats weren’t allowed to be self-sufficient. If they had been, these pet inspectors wouldn’t have jobs. Maybe the mere existence of cats is a thorn in the eye of bureaucrats, not needing any supervision or government. You just can’t let anything to unregulated…. On the last page under the heading “legislation,” the brochure refers to eight laws and regulations that contain the full ordinances on keeping cats, with this brochure being only a summary. What if I don’t have three to four hours available every day for petting my cat? And what if I simply don’t want to spend that much time with him or her? Does that mean I’m not allowed to keep a cat? To think that this would never have occurred to me on my own… It’s my experience that the cats take care of this themselves too, usually finding an open closet or something similar. I guess they project their parenting styles onto the cats… ”I can’t stand having my children around me all the time, so surely the cats can’t either.” Feminism for cats…. “Cat mum needs her night out!” I wonder how long it takes until they introduce mandatory public daycare for kittens? I think these legislators ought to take the personal integrity of the cats into account too… Don’t you think it’s insulting to them assuming that they can’t fend for themselves just because they’re of “low rank?” Typical socialist condescension. 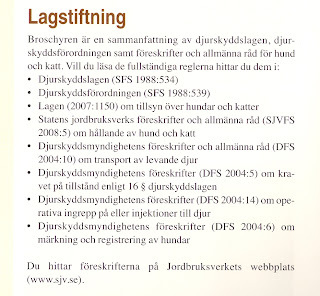 If anyone wants to inspect this insane document for himself, search for ”SJVFS 2008:5” and enter that URL into translate.google.com. I once had a kitten who defied both other kittens and adults when it came time to be fed, by not confining himself to only stand outside the bowl when he ate, like the rest of them; although his back paws were outside the bowl, he had half his body inside it, eating from the centre and effectively covering the rest of the hard food with his front paws extended to his sides, to send the message that no one else could eat while he was doing it. Oh, I wish I had taken a picture. I could have sent it to the legislators now and written something like: “Watch me follow your regulations, bureaucrats!” Hmm, that might be a bit corny I suppose. I can’t stress just how grateful I am to my esteemed government for blessing me with its enlightened and important legislation… What would I do without you? I propose a class action lawsuit on behalf of all cats. Self-sufficient and proud cats just don’t want to be subject to the same legislation as stupid and helpless dogs. I suggest a suitable compensation would be for the cats to be given the legal right to dispose of their excrement on the lawns of these legislators, to atone for the psychological harm the cats have been subjected to due to this association. Let no one compare noble cats to puny dogs again. I’m called Mimmi and I support this motion. I can be so hyperactive at times that my master found it hard getting a clean shot of me today. To get the book, go to http://www.amazon.com/Madhouse-critical-study-Swedish-society/dp/9197936219/.